Fly Fishing Mongolia and Beyond. Central Mongolian Taimen, Lenok, Pike, Grayling, and others. This trip takes in place at a lower altitude. Huge freestone rivers run through the valleys. Exceptional dry fly fishing conditions. 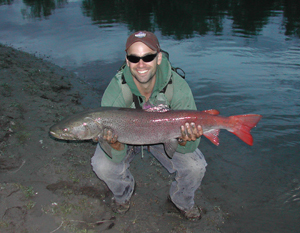 There are some exceptionally large taimen here along with possibilities of trophy pike and ravenous lenok. We will be dry fly fishing with grass hoppers and other dry's much like we would in the rivers of the western United States, except the numbers of fish that will be willing to take them will be staggering. Average lenok run in the size of 20 inches. Average taimen run 28 to 36 inch. We will likely encounter some taimen 45 inches or more. Northern Central Mongolian Taimen Fishing. This expedition will travel into one of the most remote regions of Mongolia, an area where very few people ever travel. We will be searching for the largest of salmon-ids and expect to encounter many. Much of this trip will be sight fishing to large taimen lurking in the shadows looking to ambush whitefish. We will also dry fly for grayling and Lenok. The fishing has proven exceptional along with breathtaking views of high mountains and vast open landscapes. Peter Mullett has been setting up custom flyfishing trips for individuals wishing to get off the beaten path of the big corprate travel organizations. Key West Bone Fish, Tarpon, Permit. 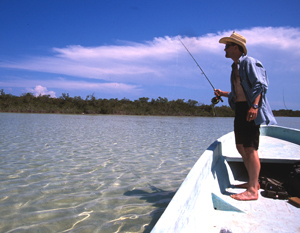 We will be fishing the flats around the Key West this spring. Our guide Mike Wilbur will pole us to some of the best salt water fishing that America has to offer. After fishing we can enjoy the nightlife that Key West has to offer. If you have never been Its not to be missed!